This term we will be looking at the artist Leonardo da Vinci, In particular, the Mona Lisa and the Baptism of Christ. You can find more information about these paintings on the link below. Have a look t the work in Classes 3 and 4. 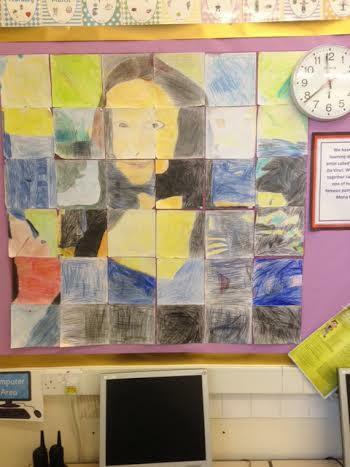 Class 3 have completed an enlarged jigsaw of the painting and Class 4 are working on recreating a "pop art" version. This term the children in Classes 2 and 3 will be thinking about what it means to remember. This will link into our memorial project later in the term. As a starting point we will be reading the following poem by J. Brainard. I remember Aunt Cleora who lived in Hollywood. Every year for Christmas she sent my brother and me a joint present of one book. I remember saying “thank you” in reply to “thank you” and then the other person doesn’t know what to say.